Lori Grant was a typical Boston-area single girl. She worked in an IT department of a high tech company in Burlington, and loved meeting up with friends after work and on weekends for a few beers and some buffalo wings before going on to a steak house. "I was in my mid-20s, and I just overate like everyone else," said Grant. "Pizza, Chinese, Mexican, huge portions, I ate it all because it tasted good." But Grant spends more time in her Littleton living room now, writing a book and working on a new business brochure for her many clients. Grant lost over 100 lbs. a few years ago and has turned success into a business that offers one-on-one coaching for those wanting to lose weight. It doesn’t matter to Grant what the cause of the weight problem is, she can advise anyone on how to live in a healthier way because she has made the long, tough journey herself. She lost nearly 70 lbs. at one point, and met her husband, although she immediately ballooned up again, gaining more than what she had lost. "I was just the opposite of most brides," said Grant. "I gained weight before the wedding." In a year and a half after the wedding, she put on 100 lbs. She loved cooking for her new husband, and the two enjoyed getting together with friends, never giving a thought to her weight. "It was our hobby," she said. "We ate. I was actually feeling horrible, but I was very good at ignoring it." Grant said she yo-yoed up and down for a few years until the day she applied for a visa so she and her husband could take an adventure vacation in Africa. "I looked at my picture and it was an epiphany," she said. "I cried for three hours." The next day she joined a gym, and signed up at Weight Watchers, and over the next year and a half, lost over 100 lbs. and regained her health. When she reached her goal, the couple took a trip to Katmandu to climb and hike in the mountains. She is now trim, and super-conscious of whatever she eats, scrupulously reading the nutritional information either online or on food labels. She eats a "ton of vegetables," and keeps an eye on portion sizes. "I had to relearn how to cook healthfully," she said. She became a Weight Watchers group leader, but still longed to counsel people on a more private basis. So with a friend from Weight Watchers, Grant opened The Coach Approach, and even though they are dissolving the company next month to pursue individual coaching, the two still agree on the basics of weight loss: watch what you eat, and exercise. Grant said she doesn’t care what program a client follows as long as the underlying issues for overeating are addressed. "The key is to do what works for you," she said. She is thinking of calling the new coaching business "Always Your Weigh." In addition to one-on-one coaching, Grant will offer free workshops at various work sites geared toward "getting people to make changes." "I go to where they are," she said, describing her weekly visits to a client’s work or home for a weigh-in and a discussion of the problem areas. "It’s completely confidential," she said. "Clients get what they need." She will, for an extra fee, go to the supermarket, even make a home visit to restock the fridge and shelves with healthy foods. She is developing a tele-coaching service to provide phone sessions. "I have changed my whole life," said Grant. "I love adventure travel now. I walk every day. I am planning to run the Boston Marathon next year. Everything is different now." For more information, call 978-549-4279 or visit www.mycoachapproach.com. 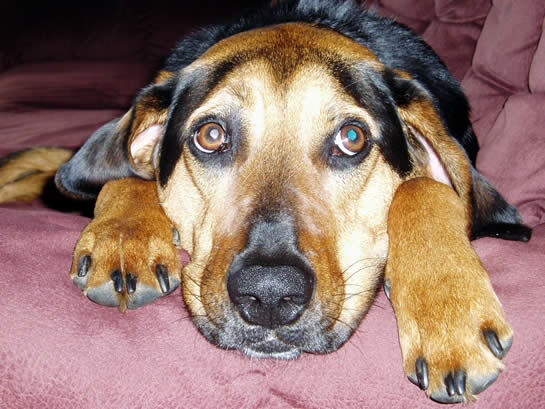 We learned today that Homer is a winner in the Boston Globe Pet Photo Contest! Woohoo! Now that I'm an award winning photographer I can quit my job and travel the country with Homer; taking photos, selling books and prints, meeting fans... it's gonna be sweet! Oh, what? This just means Homer's photo is going to be in the Sunday Globe tomorrow as part of a glossy book cover insert? Well, that's cool... but... damn; guess I still have to go to work Monday. At least Homer doesn't. Homer's had quite a weekend already. Lori was letting him outside into the backyard yesterday afternoon and he bolted right out the door after something. All of sudden Lori spots two deer in the yard too. A fawn and a doe with Homer chasing them, suddenly the doe stops and turns on Homer, chasing him away in his own yard. The only portion I caught was when the doe gave up on Homer and turned to run off into the woods with her fawn. I look out in the yard and see the deer running to the left, while Homer is stilling fleeing for his life to the right. All the while he didn't even let out a bark. Such a brave boy. One of the very few things I remember learning in the third grade was that there are 9 planets; Mercury, Venus, Earth, Mars, Jupiter, Saturn, Uranus, Neptune, and Pluto. It was just a stone cold fact, no doubt about it. We even made dioramas, models and pictures to prove it. I figured someday more planets might be discovered, but I never thought we would lose one. This week The Federation of Evil Scientists (or some such group in charge of deciding reality) declared that Pluto is no longer a planet. I'm just dumb founded. Is this some money making plot by the science text book publishers? What else did my teachers deceive me about? Maybe 2 + 2 doesn't equal 4 after all! What in the world can console me after losing a planet! D'oh, of course. Another season of The Simpsons is around the corner. 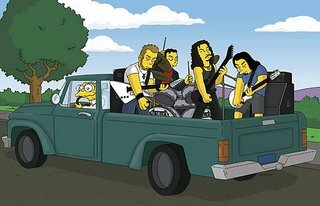 And this year's premiere features Metallica! Check it out Sunday, September 10, 2006 on Fox. And the other big news in Metalli-land; Metallica's whole catalog is finally available on iTunes! Here is official announcement. 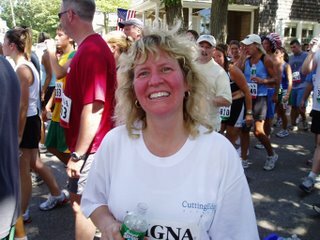 We were in Falmouth Ma on Cape Cod today so Lori could run the 34th Annual Falmouth Road Race. This was Lori's first race of any kind and her goal was pretty much not to be laughed off the course. She more than succeeded, finishing the 7 miles in 80 minutes and felt fine during and after the run. Though she joked about coming in last ever since she agreed to fill in on Team Cutting Edge for someone who had to drop out after registering, she actually came in 7,421st - far from last in the field of over 10,100 runners. Lori was so in the zone, that she didn't even look our way as she passed me and my mom cheering her on just shy of the finish line. She was even overheard stating that is was easier than she feared and she could have done it faster. So on to her next goal of the Boston Marathon in April 2007. Many people have been sending me links to various articles covering the protest by KISS fans at the Rock and Roll Hall of Fame in Cleveland. A couple hundred fans demonstrated in front of the Hall this past weekend, demanding KISS be inducted - they've been eligible since the late 1990's. Far as I'm concerned they shouldn't be inducted into anything except the Marketing Hall of Fame since they continue to tour with new band members pretending to be Ace and Peter. Today KISS is just the world's most over priced tribute band. Wow, and Gene Simmon's reality TV show "Gene Simmon's Family Jewels" premieres tonight on A&E. This is the show Gene's been pleading for since he first heard The Osbournes got picked up by MTV. Entertainment Tonight premiered the teaser for "Illegal Aliens" last night. They didn't show it in its entirety, but now you can see the whole thing anytime you want! Edgewood Studios has posted the clip for the whole world to enjoy. Check it out. Found out today that the "Illegal Aliens" teaser has been picked up for air on Entertainment Tonight! Tonight's broadcast will air only part of the teaser - a little preview for tomorrow night's (Thursday August 3rd) full showing! So be sure to try and tune in both nights. Since ET is syndicated, you will have to check your local listings for network and airtime info. Later this week the teaser will be available at Edgewood Studios.